Sept. 11, 2018, 11:06 a.m.
Whats up with that box shape in the middle? Ruins it, kind of. It's where the magic happens. It's a Strengthen-ator. Refer to above post. Sept. 16, 2018, 10 a.m. I bought my 2014 SWorks E29 new and found it to be a revelation. Descending was unreal. Climbing wasn’t too bad. Traction everywhere with the big wheels was amazing. It was agile enough. At the time I felt that it had progressive geo. Short stays. LT. Now I see that everyone has similar and that perhaps geometry may have evolved a bit more - lower and longer reach maybe than a 2014/15 E29. Since I bought my E29 I’ve also bought a 2018 Endorphin feeling that it would be more of a fun trail bike. I’m back riding the E29 more than the Knolly because 1) the two bikes are closer than I thought and 2) the knolly (with a F36 Factory and DBIL) make it a bigger bike than a typical trail bike, and the older E29 beats it. A friend of mine just picked up the Firebird 29. It seems to have similar manners to the E29 in that it’s a descending beast but perhaps it’s geo climbs better? Those of you who have had 2014/15 E29s and have moved on, what has your experience been? I’m still loving the E29 but I tend not to follow brand trends or bike innovation that closely. E29 was perhaps ahead of others back that day -not anymore. Curious where people think it fits in now. Sept. 16, 2018, 7:38 p.m.
Good friend of mine has a 2014 and a 2018 , he noticed a huge difference between them. And riding with him I have noticed a difference in his riding. He climbs better and is faster on the down as well. It,s not a problem free ride though , he,s currently breaking the straight pull spokes( rear) , and has blown the rear shock (Ohlins ). Other than those issues he loves the bike and feels it was worth the investment. Sept. 21, 2018, 10:21 a.m. Some measurements with my iPhone based off the stanchions. Sept. 21, 2018, 11:26 a.m. The Stumpjumper EVO 29 carbo is coming, at $7500usd for the build below. This leaked onto MTBR last week but since has been taken off Spec's website. Sept. 21, 2018, 11:46 a.m.
Those of you who have had 2014/15 E29s and have moved on, what has your experience been? I’m still loving the E29 but I tend not to follow brand trends or bike innovation that closely. E29 was perhaps ahead of others back that day -not anymore. Curious where people think it fits in now. I am in the exact same position - I have a 2015 E29, which still feels like close to the perfect bike for me, but I am also curious to try out the newer style longer & slacker long-travel 29ers. One of the things that I like the most about the older E29 is that it still feels very nimble and I'm wondering how much that would be decreased with the slacker geo. Sept. 22, 2018, 1:09 p.m.
the old E29 has XC geo.... if you read some of the reviews on the EVO on mtbr, no lack of nimbleness. Sept. 25, 2018, 8:35 p.m.
Pivot had a huge demo here on the weekend, i rode the Firebird 29 (xl) for an hour. it was a very nice bike and stiff as hell. for tight and twisty mid speed trails, (most trails here) it wouldn't be my jam. my Patrol is a better trail bike. i wonder if i just prefer 29ers in a shorter travel package. FB felt very much like a monster truck for big mtn racing. Joe Schwartz was on our group ride last night with a new Kona process 153 29er. this bike intrigues me with its super short stays, long reach, steep SA and not too slack HA. it might be less full sled and better suited to tighter trails. very cool looking bike with a sick build kit (Agent wheels, etc) on Joe's bike. I rode a carbon version last night at Bear Mtn , tried a medium and large. The large fit me well , easily the best climbing bike I have ridden. On the down I did not get a feeling of let it go and hang on like I have with the other Process models. Sept. 28, 2018, 5:10 a.m.
like it,s a surprise LOL #boutF'ntime!!!! 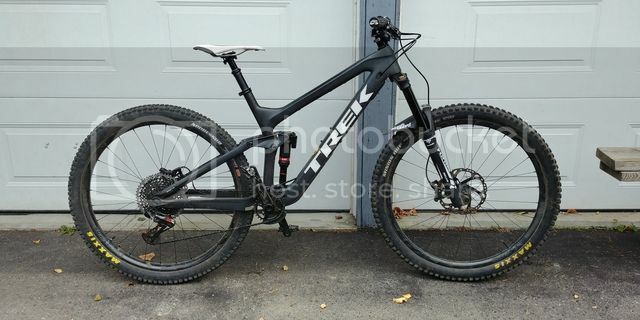 2019 Trek Slash 9.9 RSL custom build... shredtastic!! Nov. 11, 2018, 9:47 p.m.
Nov. 12, 2018, 9:44 a.m.
New Stumpjumper EVO looks interesting at 63.5/64* and long with 140mm. Reviews seem to say it can pedal up but theyre not calling it an Enduro bike (that Ive seen). Interesting bike. Alloy only for now.